Imagine having the right show prep delivered to you on time, EVERY day, without fail. It’s like having your own private PA and Production Team who you trust completely, getting you everything you need, how you need it & when you need it. The very latest headlines, stories, showbiz, music, sport, lifestyle information, surveys, birthdays, ideas and just about everything you need. It's all written, edited, laid-out and ready to go, just for you. No chasing round looking for things to use on your show, no running out of time before the show, no trying to sight-read the newspapers, no wondering if your prep will arrive on time or worse still having it compiled the day before with out-of-date news! A really comprehensive round up of every- thing that’s going on. A one-stop-shop for sense of the day links and thought-provoking content. Excellent. I use Show Prep everyday and it is essential to my radio broadcasting. It takes all the strain of having to trawl through endless newspapers and the web, when I can get it at the click of a mouse. Whether you’re the Morning Show presenter on a major market radio station, a weekend presenter on a small market station, or somewhere in between, you’ll know that good preparation is an essential ingredient for great radio … and that preparation is often the thing that gets squeezed when the pressure is on! Of course the answer isn’t just to get up even earlier or to work even harder, with less time for you, your family, friends and ‘real life’. The answer is to work smarter, and Show Prep from Radio Warfare is a very smart service. 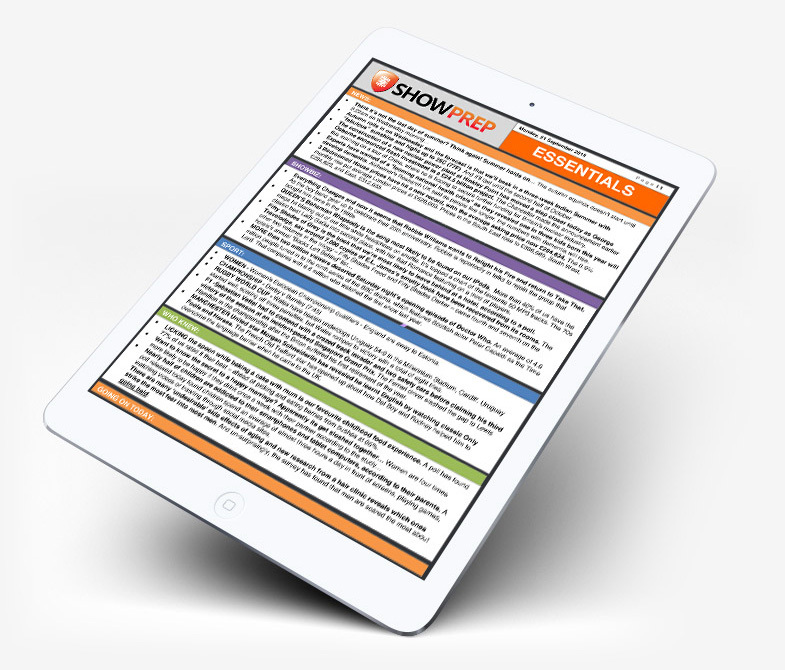 Show Prep is a new UK-based and UK-focused prep service that can help you raise your game on air, improve your show, and save you time & money. Save hours every day, so you can spend less time on research and more time on being creative. Much cheaper than buying all the newspapers every day – or even just two or three – and much more topical & targeted too. Your Show Prep is specifically designed and written for radio presenters, producers and programmers. Written, edited, laid out and presented so that it’s ready for broadcast and can immediately be used out loud. Your Show Prep is delivered every weekday morning by 5am so that it’s there when you need it. Written early in the morning, not the night before, so you have the very latest news and information. Packed with topical stories, showbiz, sport, surveys, lifestyle information, comments, feature ideas and much more. The latest updates from Great Britain, the US, the EU and from key countries all around the world, presented from a UK point of view. Take the 7 Day £1 Trial, with the 100% risk free guarantee of your £1 back if you don’t think the Show Prep Service is right for you. 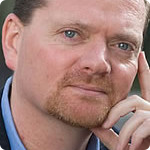 Francis is an International Radio Consultant, Trainer & Coach. He is the former Group PD of Heart and launch PD of Magic. Paul is widely recognised as the best show prep writer in the UK. 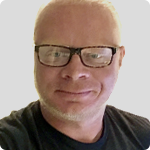 He controls and edits your Show Prep on a daily basis. An excellent service – spot on and better than the rest out there! Everything is laid out with ease so – at a click of a button or a turn of a page – you have your ‘sense of day’ story or one liners of showbiz which is just right. Well recommended! I use Show Prep everyday and it is essential to my radio broadcasting. It takes all the strain of having to trawl through endless newspapers and the web, when I can get it at the click of a mouse. We’re so confident you’ll love the Show Prep service from Radio Warfare that we’re giving you the chance to take a 7 day £1 trial! We’re also giving you a cast-iron promise that if, during the trial, you don’t think it represents great value for money and the best prep service you ever tried, we’ll send you back the £1! 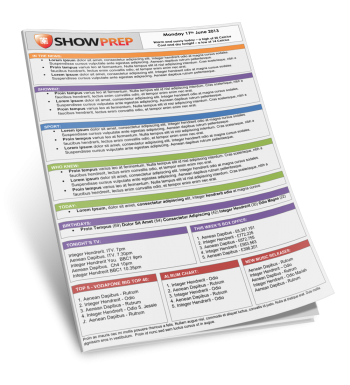 Take the Show Prep 7 Day £1 Trial for up to a week. If you don’t find it absolutely invaluable, all you have to do is cancel the trial in the first seven days, then just call us and we’ll send you back the £1.00! 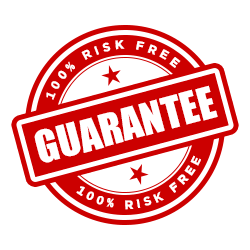 It’s a 100% risk free with a money-back guarantee so that you can find out what a big difference the Show Prep will make to you and your show. Essentials Edition A three pager with all the show prep essentials you need, delivered every weekday morning by 5.00am. Daily Edition Up to twenty-five pages of comprehensive show prep every weekday morning, delivered by 5.00am, & the Weekend Edition free! Weekend Edition A digest of the best of the week, delivered ready for the weekend & public holidays. The monthly fees quoted below are for a show licence. This allows Show Prep to be used on an individual local or regional radio show. If you would like to licence Show Prep for all shows on a local or regional station, or for a national radio station or television station, please contact us for further licensing options. Please note your PayPal subscription will be to Media Services Direct for your Show Prep from Radio Warfare. Other easy payment options, including Direct Debit, are available. For more details please contact us.